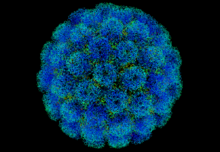 SV40 is an abbreviation for Simian vacuolating virus 40 or Simian virus 40, a polyomavirus that is found in both monkeys and humans. Like other polyomaviruses, SV40 is a DNA virus that has the potential to cause tumors, but most often persists as a latent infection. SV40 became a highly controversial subject after it was revealed that millions were exposed to the virus after receiving a contaminated polio vaccine.